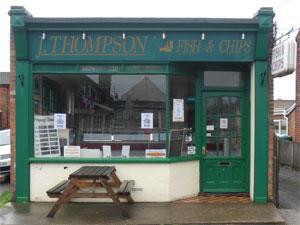 J Thompson's Fish & Chips01493 728006work Fish & ChipsJ Thompson's Fish & Chips located in the village of Caister-on-Sea near Great Yarmouth is a popular takeaway venue with residents and visitors. J Thompson's Fish & Chips located in the village of Caister-on-Sea near Great Yarmouth is a popular takeaway venue with residents and visitors. On arrival in Great Yarmouth follow signs for the A149 towards Caister-on-Sea, proceeding straight ahead at the Yarmouth Stadium mini roundabout into the village. Take a right turn at the next mini roundabout onto Tan Lane, J Thompson's Fish & Chips is located at the far end of the road on the right hand side, near to the beach access.